Watch the latest visual from Reputation. Taylor Swift dances through the streets in the rain during her "Delicate" video, the latest track from 2017's Reputation to get a visual. The clip, directed by regular collaborator Joseph Kahn, shows Swift living her life as if she were invisible. Check it out above. The "Delicate" video was filmed over two nights in downtown Los Angeles and features landmarks such as the Los Angeles Theater. 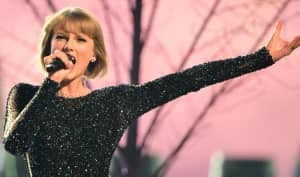 It was debuted on Sunday evening at the 2018 iHeartRadio Music Awards, where Swift picked up the Female Artist of the Year award. Swift's worldwide Reputation stadium tour starts on May 8 in Arizona. She will be supported on all dates by Camila Cabello and Charli XCX.